Visionscape Sanitation Solution and private sector participant (PSP) operators, now referred to as waste collection operators (WCO), have resolved to work together for the common good of the people of Lagos State. Following months of negotiations, offers and counter offers, both parties have agreed terms of operations that brings the WCOs back into the system as residential waste collectors while Visionscape deepens its waste infrastructure contract. The resolution was also motivated by the recent fire outbreak at the Olusosun dumpsite, which emphasized the need for engineered landfills and standard waste infrastructure to avoid more environmental catastrophes. Speaking on the new direction, the CEO of Visionscape Sanitation Solutions, Mr. John Irvine, noted that it was a welcome development as the new terms give the environmental utility company the opportunity to focus on, and construct, infrastructure that is vital to the success of any waste management reform. He mentioned that Visionscape was already in control of three transfer loading stations and three vehicle maintenance depots, in addition to the ongoing construction of the first engineered landfill in West Africa in Epe, Lagos State. The new arrangement will facilitate the accelerated development of more transfer loading stations, a biomass plant, recycling facility, waste to energy plants, landfill and dumpsite remediation and wastewater treatment infrastructure. 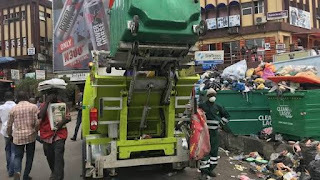 The PSP operators had requested a larger role in the Cleaner Lagos Initiative (CLI). The new agreement will increase the sphere of their operations beyond commercial to residential waste collection, where they will bill and service homes across the State. To ease some of the challenges experienced by the WCOs prior to the reform, Visionscape also agreed to assist the WCOs in their operations. John Irvine said: “Sometimes you must compromise for the sake of the common good. We listened to all stakeholders, and our intentions were always to be part of a community. Both sides understand each other’s aspirations, and have chosen to focus on our commonalities, put the controversy behind us and move forward collectively as a community. We will continue to support our partner operators with equipment and capacity upgrade for better collection and carry out interventions required to fill service gaps.” said, Visionscape Sanitation CEO, John Irvine. This new agreement is expected to take effect immediately.